We supply a large range of lockers for most situations: Laminate pool locker, school locker and workplace lockers, some are available on a next day delivery. System 1300HD and Probe laminate door lockers are designed to withstand abuse such as kicking the doors, the compact grade laminate doors are very strong and tough and can withstand direct impact to the locker doors. System 1300EHD laminate door lockers have been designed in participation with schools to provide the most robust solution possible. This locker has an inset laminate door which sits in a door frame making it very robust against impact from the front. The locker has cross members between compartments; the cross members are welded into the frame providing a guard against damaging the locker shelves. We supply the full range of Probe lockers this locker carries a fire rating and includes laptop and tablet storage and charging lockers. All Probe lockers are powder coated with Activecoat the hard wearing anti-bacterial powder coating for the most stringent hygienic environment. We offer an extensive range of good value lockers for lockers for schools and education establishments in the UK. Our school lockers have been specifically designed with the assistance of schools especially the System 1300EHD range. We offer an extensive colour range. Our Atlas locker and Atlas junior school lockers can be delivered within 5 working days. This is why our customers have rated us 4.6 out of 5 through the independent review agency Collect Reviews. 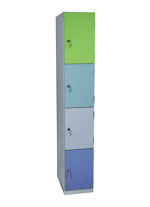 We have a standard range of primary school lockers from our Atlas Junior School range. We also design and manufacture lockers to meet schools specific needs. We can also tailor make our System 1300hd laminate door lockers to meet the needs of junior schools. Locking options; if you don’t want keyed locks we can provide lockers with swivel hasp locks that can be used as a handle. They also represent extreme value for money and will look great long after other lockers have needed replacing. There are not many environments that are more challenging to lockers than high schools, and this is why Total Locker Service has three levels of robustness dependent on the needs of the school, we at Total Locker Service are more than happy to advise as to the most appropriate lockers for your particular school. For when space is at a premium in schools and the corridors will not fit lockers our eXtreme plastic lockers are a good solution as they are very robust strong and will not rust. This eXtreme plastic locker is perfect for using outside against a wall or back to back. We at Total Locker Service support our lockers with parts for the economical life of the locker, we hold in stock replacement locks for all our lockers. Need replacement doors then we can make them to order. Need to convert your locks to an alternative type then we can offer you an enormous range often conversion kits and advise as to the possibility.